This is a guest post by Millionaire Mob, a blog focused on investing in dividend growth stocks, passive income ideas and travel hacking. We have helped thousands of people with bettering their financial future through our personal finance tips. A solid network is a promising asset in your financial freedom journey. Having a strong network is crucial to achieving financial independence. “No man is an island” an old adage goes. 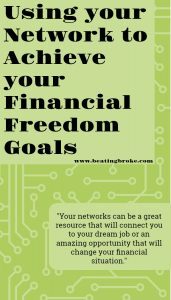 How are you utilizing your existing networks to reach your financial goals? We are social beings and are connected with different people within different circles. We have people around us some who are family, friends, and colleagues that we have formed a strong bond with. These people can support us in one way or another to realize our financial goals. Before you enlist the help of your network, you first need to have a clear goal of what you intend to attain. You need to plan why and how you will accumulate wealth and build a firm financial foundation. Our study shows that the true meaning of accumulated wealth is approximately 11x your income. Set a plan of action with details of how you are going to generate income. Find out how you can diversify your income sources. Perform a research on different investments available to you. Read different resources to discover more information about the types, the advantages, and disadvantages of different investments. Get the opinions of diverse financial advisors and join their networks. Consider different investments that you can involve in. Engage in active, passive and portfolio income ideas. Consider getting a part-time job or try to obtain online jobs. Check out this list of over 23 proven online jobs without investment. Whatever your financial targets are, they need to be clear and achievable. Define your deliverables, set quantifiable goals and gauge the level of risk appropriate for you. Set a timeframe on when to achieve every milestone. Be disciplined and avoid that which can distract you from your vision. If you set realistic goals, you are more likely to attract people with similar financial ambitions and resolutions. Your networks can be a great resource that will connect you to your dream job or an amazing opportunity that will change your financial situation. You can find potential partners to strike profitable business deals with that will take your business to another level. Your connections can also become your clients if you can offer valuable products to them. All you need is just to be outstanding in what you do. These prospects this can be obtained without necessarily spamming your connections but by presenting and positioning yourself in such a way that opportunities find you. In one way or another, it will help raise your financial position and ultimately reach your financial goal. With recent developments in technology, it is easier today to make more connections with friends, bosses, classmates, customers etc over social media platforms such as Facebook, LinkedIn, Whatsapp and Twitter among others. Take advantage of these platforms to expand your circle of influence. Reach out to potential employers and be ready to grab every opportunity that may come your way. Be ready to deliver value and to produce exceptional results in your work so at to get referrals. When you are outstanding in what you do, you are more likely to attract and maintain quality connections that will thrust you to your financial destiny. A challenge helps to keep the participants on their toes until they achieve their objectives. Start a financial challenge, for example, a challenge that can help to fix bad financial habits that can ruin your dream. You can start a challenge to clear all your debts within the shortest time possible and enlist your networks to become part of it. Get and share resources to motivate and inspire each other to pay off debts. It could also be a challenge to live frugally and to save as much as possible. Start a savings challenge. Find ways to help save and reduce expenses. Share discounted products, items on sale, and couponing ideas among other saving tips. You can also incorporate the use of different financial apps. Some apps like Spendee, Dollar bird, etc help you to track your expenses, manage budgets and track purchases among other great features. You can form a group of friends or create a savings group through social media and start the challenge. It can be a year-long or a few months challenge. Make clear the rules and the governing the group, set milestones and track the progress. For each month, week or day try to set-up or create a task to accomplish, the tools that you will need and the timeframe to do it. At the end of the challenge, gauge the outcome and see if there were any changes in your financial position. Create a new challenge and continue with the cycle. When you create a group of people who are up to the challenge, it helps you to remain committed to the main agenda of the group and to be accountable to each other. A financial challenge can help to keep you on the check and help you to avoid bad financial habits that are not aligned to your ultimate objectives. Ensure that you have connections with people who have similar interests and learn from them. They may be resourceful especially if they have done something or have similar goals that you intend to achieve. They can also share with you different tips and tricks, what to do and mistakes to avoid achieving the specific goals. Share your financial objectives with people in your networks. You can use the social network platforms to engage with other professionals, join groups and forums that discuss financial matters and opportunities. Share content, create and post blog posts and online profiles with an aim to connect with other people with similar interests. You are more likely to get tips and tricks from people you share related interests with. They can also encourage and motivate you to remain focused on your financial goals. Financial freedom cannot be achieved in isolation. You must have and nurture your connections and be committed to making it possible. You should make it a priority to prepare and set clear financial goals before you enlist your networks. The financial objectives will also help you find people with common interests who will inspire you along the journey towards financial freedom. Sign up here to receive a weekly (on Tuesdays) email with the most recent posts from Beating Broke along with some occasional special emails (about Quarterly) from Beating Broke. Millionaire Mob is where people come together to find the best travel deals and financial advice. We specialize in dividend growth investing, passive income and travel hacking. Our advice has helped thousands of people travel the world and achieve financial freedom. Millionaire Mob hopes to provide the best advice to help you learn and grow along the way. Follow us on Instagram, Twitter and/or Facebook for all the latest updates.